The last few matchups have been quite close but only one driver can be victorious each time, and they progress onto what we are officially calling the semi-finals, even though the numbers don't add up. 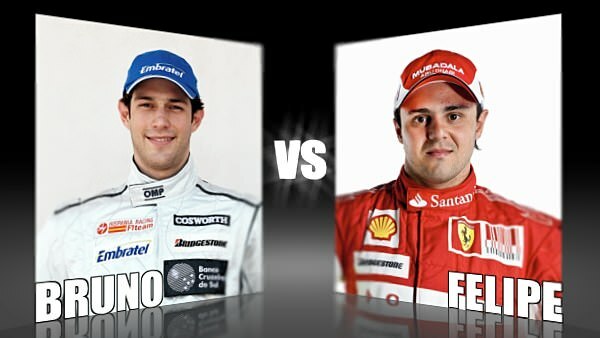 Today we're pitting two Brazilians against each other - the ever-popular Bruno Senna against the much-loved Felipe Massa. Bruno's first round was a contentious one - against Jaime Alguersuari, the votes had to be recounted once the poll was closed. Senna eventually came out victorious and moved on to round two. Let's hope the same can be said of the ongoing driver nightmare at HRT. At the moment he is in the car alongside Sakon Yamamoto, but we all know which two drivers we'd like to see in the Hispania team. Massa's first round saw a relatively easy victory over Kamui Kobayashi, but it will be interesting to see how the events of Germany affect the voting this time round. Do people think less or more of Massa for his capitulation or "magnanimous" actions in moving out the way for Alonso? Where will your vote lie today?